Kwik Kar Marsh is proud to announce its quarterly class that teaches women and men ages 15 and up the basics of automotive maintenance. The Kwik Kar Marsh “Hood” Raiders automotive maintenance class is FREE of charge and the details are below. At Kwik Kar Marsh, we understand that very few of you know about automotive maintenance and we’re here to ease your fears of going to an auto shop. “Let’s face it. We do not want to get ripped off and we just do not have the time to teach our kids because some of us were never taught how to maintain our own vehicles,” said Corrine Hudson, Owner of Kwik Kar Marsh. “As an owner of Kwik Kar Marsh, with a Mechanical Engineering background, I strongly believe that involving adults, seniors and teens in the technical field is paramount and this is our way of giving back to our community,” continues Corrine Hudson. The “Hood” Raiders class provides a safe and friendly environment for teens 15 and up, adults and seniors to quickly learn the basics of maintaining a car or truck. The “Hood” Raiders class is an immersive hands on automotive course that begins with an interactive presentation. If you’d rather just observe, that is ok too! Most importantly, “Hood” Raiders should be armed with lots and lots of questions! It’s true what they say, there really are NO STUPID QUESTIONS! We tested this theory! At Kwik Kar Marsh, we strongly believe in diversity and inclusion by empowering women and men ages 17 and up to be more involved in STEM (Science, Technology, Engineering, and Math). 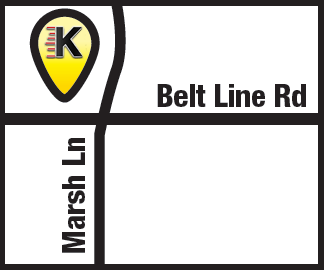 Kwik Kar Marsh is conveniently located at the corner of Marsh Lane at Belt Line Rd and serves Addison, Carrollton, Farmers Branch, Dallas, Lewisville, Plano, Coppell and surrounding areas. Sign ups are exclusive, but please feel free to get on the list when the next car class is scheduled.